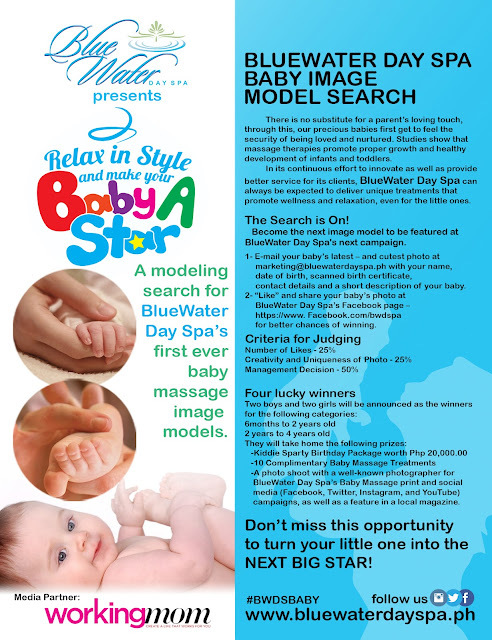 Rina's Rainbow: Baby Model Search for Blue Water Day Spa's Baby Massage! At first I thought it was a bit weird. I mean, do babies really need a special massage treatment? Will the baby appreciate it? Will he/she stay still during the whole duration of the treatment? 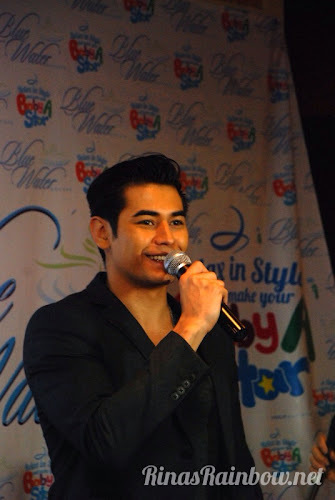 But after watching a video they played during a launch at Chilli's Greenhills of a baby they massaged, the little cutie pie seemed to like it. He was behaved while he allows the massage therapist to do her magic. Note: If you're a mom of an adorable baby ages 6 months to 4 years old, you might want to continue reading! So anyway, because this baby treatment has been a success and is well-received by their customers, Blue Water Day Spa is launching their exciting promotion! The first-ever search for Blue Water Day Spa Image Models! Duration of the contest: June 6 to August 6, 2013! 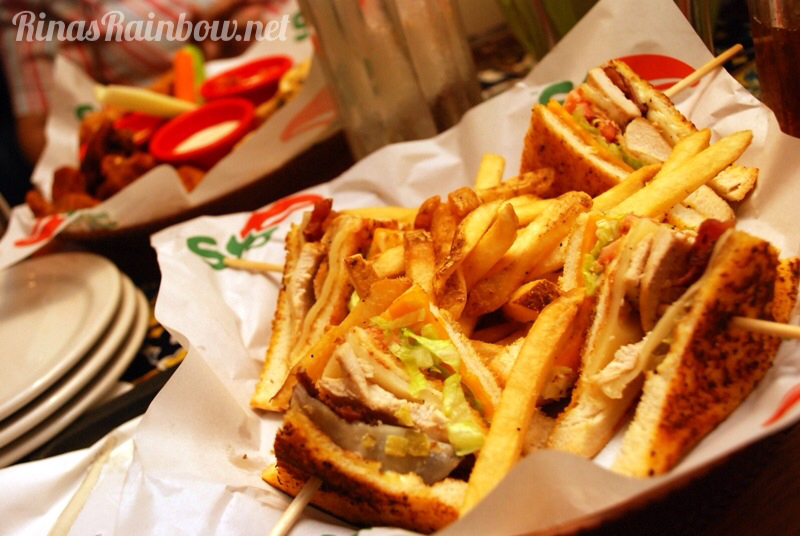 There will be a total of 4 winners. One baby boy and baby girl aged 6 months to 2 years old, and again another baby boy and a baby girl aged 2 years old to 4 years old. 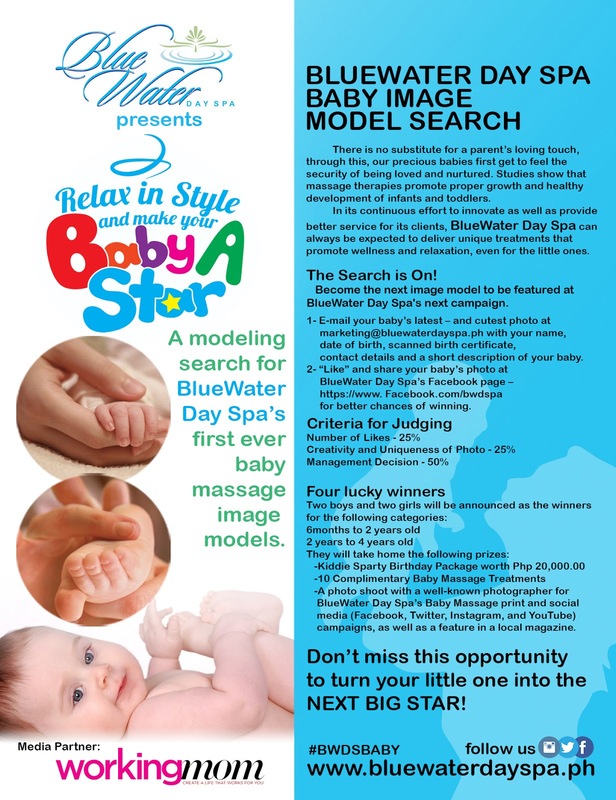 Blue Water Day Spa will then upload your baby's photo on the Blue Water Day Spa Facebook page. You then have to visit the page and like and share the page for more chances of winning. Make sure your entry is complete otherwise it will not be qualified. Also, babies related to any Blue Water Day Spa employee up to 2nd degree will not be eligible to join. Sorry! Winners will be announced on their Facebook Page and twitter on August 8, 2013. So there you go! You have until August 6 to send your entries so grab those cameras and snap away! 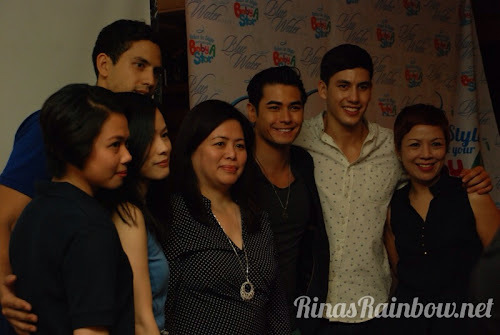 :-) stage mommy mode -on! 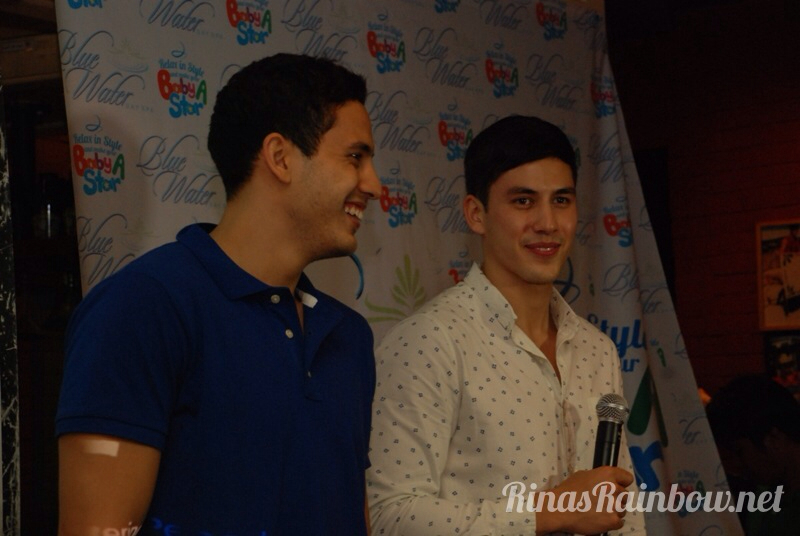 The event was hosted by Chilli's Greenhills. I have read the post fully and also want to have appointment for my babay as in my point of view she has some disturbance in her belly and I want to have her to get some clinical pilates techniques to get rid of disturbance. Children are thee most precious things in the world and we can do any thing for their benefit and to provide them relief in their lives but we all know that they cannot tell that what pain they have and for this we have system of Naturopathy can help your immune system in Queenscliff to enhance the immunity of the baby so that he can fight the diseases itself and your worries can be minimized. With this link of the baby model you can define the best site here and can make your life more good. You can also promote your service with https://www.healthnfitnessvigilante.com and can find the new zone of the best system with this area.